Participants at the ongoing 11th African Economic Conference in Abuja advocated for measures that will guarantee women access to land and promote women’s land rights in rural communities of Africa. Speakers at a Monday session on land at the annual conference, which is co-organized by the African Development Bank (AfDB), the United Nations Economic Commission for Africa (ECA) and United Nations Development Programme (UNDP), insisted that since women contribute largely to agricultural productivity, it is imperative that their interests regarding land rights are secured. Kacana Sipangule, a Research Fellow from Kiel Institute for the World Economy in Germany, said that governments of African nations should identify specific needs of the farmers and ensure agri-business investments do not threaten their farmland. In her paper titled, "Tenure security, smallholder investments and large-scale agriculture", Sipangule explained that her study results revealed how farmers in Tanzania felt threatened by foreign investors and the possibility of them encroaching or taking over their farmland. "The paper was motivated by the increase in the demand for land in developing countries from foreign firms," Sipangule explained. "Government should look at the specific needs of the farmers," she said, adding that governments should ensure that property rights are secured, before big investors come, "because investments will always come and increase their productivity. There should be mechanisms to safeguard property rights of these smallholders, so that farmers can benefit without feeling threatened by these agriculture investments." 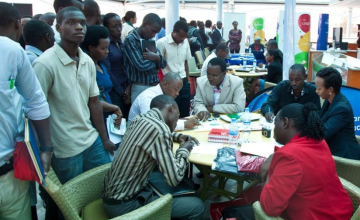 East Africa's Young People - an Asset or a Problem? According to Linda Staude reporting for Deutsche Welle, the East African population is growing at a yearly rate of 3%. Estimates show that by 2100 four billion people will be living in Africa. A young population offers a good chance for quick economic growth, says the International Monetary Fund. Provided there are enough jobs, food and social services. Based on her study, she said for about 10 years, agro-allied firms were acquiring lands of rural farmers in most developing nations in Africa. "Surprisingly, the theory shows that when the rural farmers feel threatened, the farmers also stop producing. The smallholder farmers stop investing in their property. But the local farmers continued to invest in Tanzania and this is because the threat might not be so immediate, but the firms also bring a lot of spillovers which smallholders are able to imitate and they could use to increase their productivity." In his remarks, UNDP Nigeria Senior Economic Adviser Ojijo Daniel Odhiambo described land matters in Africa had a gender dimension, whereby women farmers are discriminated against despite their high productivity. He said their potential to invest more in lands is often limited, even when women farmers have access to the land. However, Odhiambo added that women farmers were often faced with the challenge of using the land as collateral for loans. "I think we need land reforms that will ensure that women have control and security for 10 years over the land. That means they can actually access credit, they can also build confidence to invest in that land, going forward," said Odhiambo. "We want to address the food security issue, but let us also address the gender dimension, which is very critical. If the number of women is high in terms of labour in the agricultural sector, that means they must also have access to productive assets, such as land, capital and credit that they can use to invest."